Despite walking past it many times, it never occurred to me to visit Skinny Kitchen. For a start, the name really put me off. The word ‘skinny’ when associated with food just has too many negative connotations — diets; those tasteless, reduced-fat versions of food that are laden with sugar to make up for the loss of flavour; and pressure to fit a certain body type, which is unrealistic for many. As it turns out, Skinny Kitchen’s focus is foods that complement your fitness routine and suit your lifestyle. 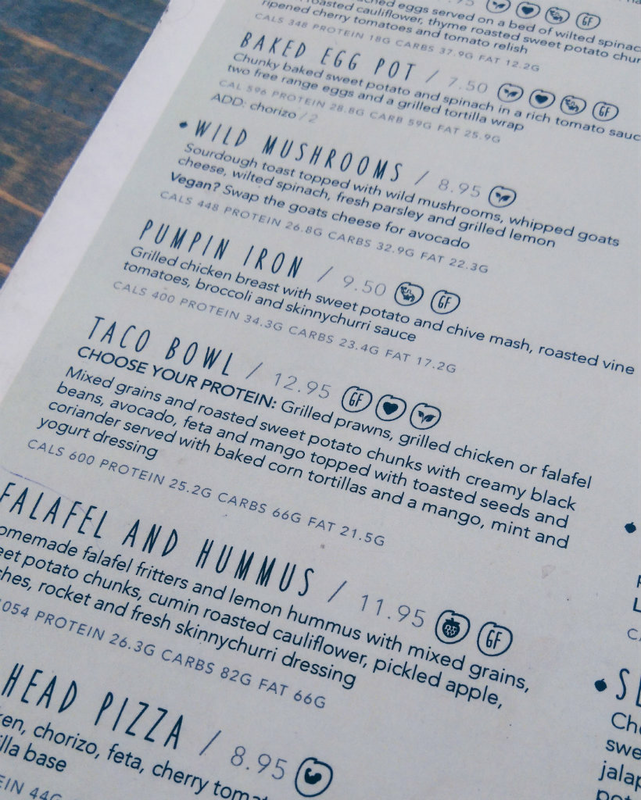 Their ingredients are natural and locally sourced, and they are very accommodating towards vegetarians and vegans, with notes dotted throughout the menu telling you how a meal can be made vegan. … except I didn’t even have pancakes in the end! I really fancied something savoury and we both went for a taco bowl. The veggie version comes with two massive falafels, which were crisp on the outside, fluffy on the inside, and very filling. The bulk of the bowl was made up of mixed grains, roasted sweet potato chunks (love a bit of sweet potato), avocado, and the most deliciously creamy black beans I’ve ever eaten. The saltiness of the feta cheese was a nice contrast with the sweetness of the mango pieces, while the coriander and the dressing (mango, mint, and yogurt) tied everything together. 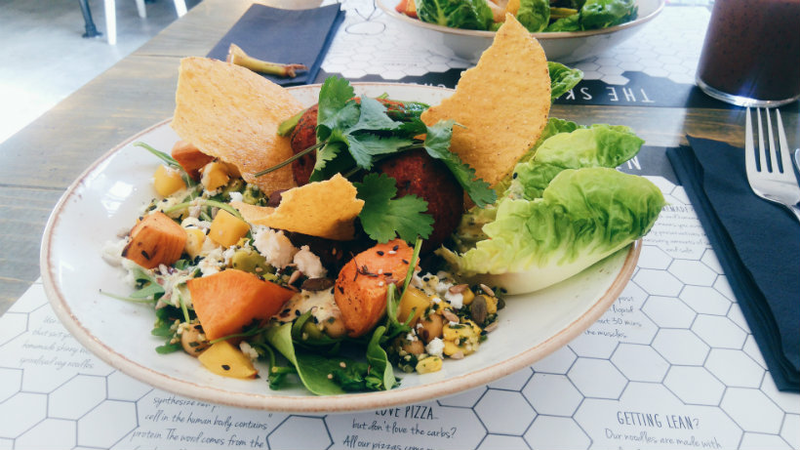 Whoever said healthy veggie food has no flavour had clearly never tried anything like this. There was no way I was leaving without trying one of the smoothies. Steph and I picked the same thing again — the Superfood City smoothie, with blueberries, banana, mango, spirulina, goji berries, bee pollen, and almond milk. 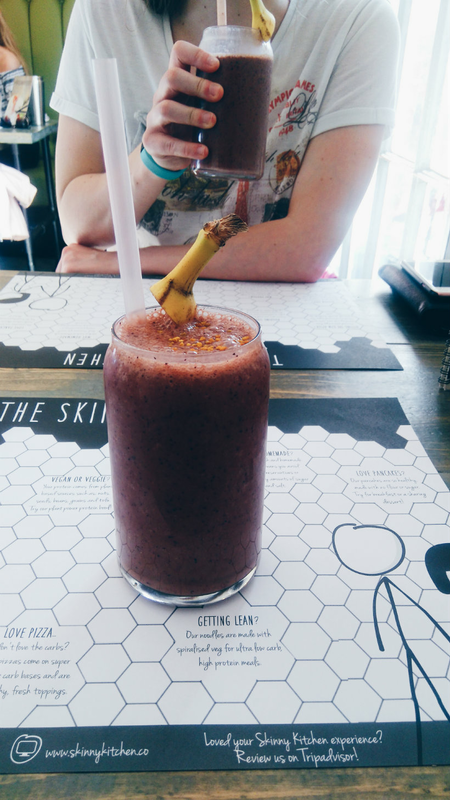 It was fruity without being too sweet and the almond milk meant it wasn’t too rich, while the goji berries and the bee pollen (which I was unsure about at first) gave it a nice sharp kick. Overall I was really impressed with my meal — I can see why Steph raved about it so much! It was a little bit overpriced (I paid around £17 for a main and a drink) but the portion sizes were perfect and everything was delicious. I also appreciated how open they were about veggie options, vegan options, gluten-free and dairy-free dishes. It makes going out to eat so much easier when everything is clearly labelled. I’m still not sold on the name, but I daresay I’ll go back to Skinny Kitchen to try a stack of pancakes soon. Have you been for any good meals out recently? What do you think about the name Skinny Kitchen?Let me know in the comments!